£8 will be charge for the venue, water, tea, biscuits. To confirm, please text me on 07752168159. 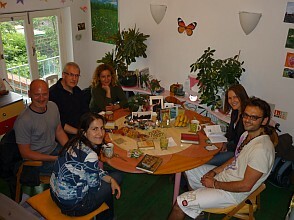 Reiki people from all three degrees get together to exchange treatments. Often people come to the shares because they have just started working with energy and want to get more experience and confidence when giving a treatment. Working in pairs, each pair gets a treatment couch and gives each other a full body treatment for one hour.. The Reiki share could also help you to create a balance between giving and receiving. Some people, for example, find it easier to give a treatment than to receive one. This shows an imbalance and will also have an effect on how you deal with situations in your every day life. Changing a pattern like this might take several sessions so please be patient with yourself. The energy of the Reiki Share is very special. People have all kinds of experiences that help them connect more fully with their spiritual side. Another way to share Reiki in the group is to have one person lying on the treatment couch receiving Reiki from all the others at the same time. This will usually only take 20 min for each person, at the end of which we will ask the person which area he/she wants to receive a tower healing when we stack all our hands on top of each other for powerful concentrated healing in the desired area.